Golden retrievers are basically the best dogs in the whole history of forever, but that's because they make up for their antics in major cuteness. Here's what it's actually like living with a golden retriever. Hint: it's AWESOME. Goldens have such a pretty coat, but they shed worse than any girl ever will. Their hair will end up in fluffy dust balls in corners, under the couch, attached to the edges of rugs, and all over your bed. You can sweep in the morning and find even more of it by bedtime. You set your dinner down on the table, walk away for one second, and come back to find an empty plate. Tables are right at eye level for golden retrievers so it’s not exactly hard for them to nab some grub. And no, you won’t even be able to punish your pup for it. Curse those sweet, brown eyes. Tails are constantly whacking furniture. There is nothing like the excitement of a golden retriever. A tail starts wagging simply because you walk into the same room. Goldens are ecstatic about everything, so those tails are going 90 to nothing all day long. And they don’t care if they knock over a flaming candle or a small child. The entire backyard is tracked in. Yes, that golden coat is beautiful, but it also attracts every bit of dirt, fallen leaves, and small twigs that your backyard has to offer. That’s why your floor is covered in dirt and foliage. The broom is now your favorite cleaning tool. You will feel terrible for leaving the house. They know when you’re about to leave, and like the little guilt machines they are, they turn those big ole puppy dog eyes on you. Oh, were you excited for a night out? Well, you can’t enjoy it now. There is nothing more exciting to them than going on a walk. A walk is like winning the lottery to golden retrievers. That tail will start wagging so violently that his or her whole body will wiggle from side to side. As soon as the door opens, a golden will bolt out of the house, so you better hold tight to that leash. 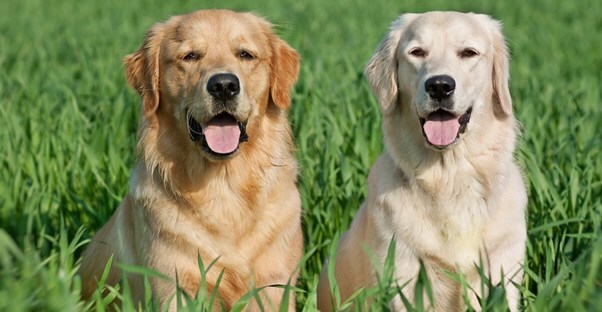 Warning: golden retrievers want to pee every five feet and befriend all of the other dogs. Coming home is the best thing you will ever do for a golden retriever. Seriously, there is no better gift for a golden retriever. They are loyal, loving, and hate being without you. The second you walk through the door, he or she will be all over you like white on rice. Enjoy those puppy kisses. They’re the best. Golden retrievers aren’t just dogs, they’re part of the family. Your golden is so much more than a pet. If you don’t have children, then your golden will become your first-born. If you grow up with one, then your golden retriever is a best friend, sibling, and protector all rolled up into one.